Hello! 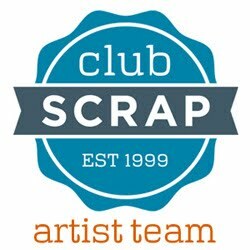 Welcome to the Club Scrap Vintage Botany Blog Hop and Linky Party! If you've been following along on the hop you should have just come from Tricia's blog. This month's Vintage Botany collection is just beautiful! Love the color combination and images. I made an accordion fold perpetual calendar. I stamped the front panel image using an image from the unmounted rubber stamps with archival ink. 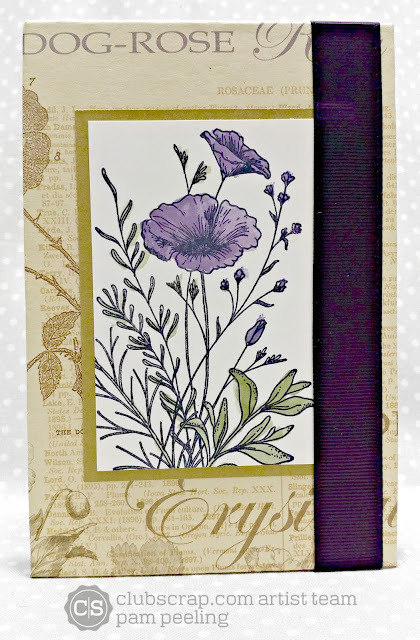 Then I used a water brush and stamp pad ink to color in the flowers and leaves. I made pockets on all the accordion pages to hold a tag. I printed the words on card stock on my computer, then just cut them down to 2 3/4" x 4 1/2" to make the tag to write the names and dates on. Here's the other side with the rest of the months. You can decorate the pockets and tags as much as you want! 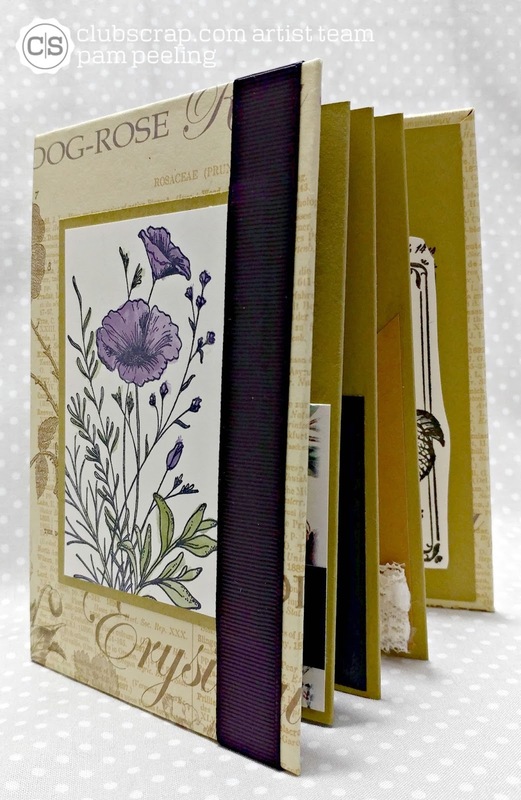 I love those little wooden postage stamps buttons in the Vintage Botany Collection-so cute! I used a Sizzix die cut to cut the pull tab. You could a piece of ribbon or just a small circle cut and folded over. So many possibilities! Now on to the directions! 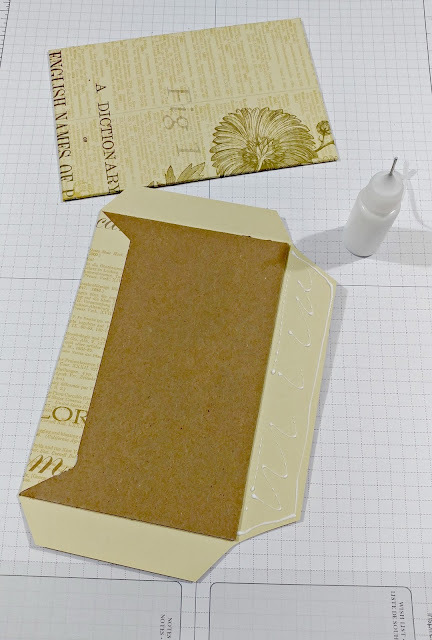 Cut 2 pieces of chip board or book board fat 4" x 6" for the covers. 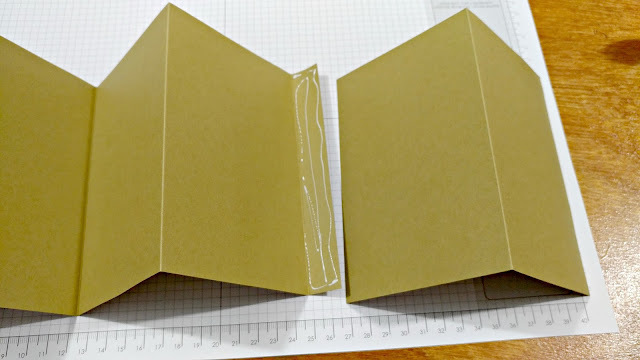 Then cover them with a piece of card stock that measures 6" x 7 1/2." I used Club Scrap bookbinding glue in a needle tip applicator. That thing is awesome! I used to brush the glue on and that worked but was so much messier than this! Love this little thing! cut 2 pieces of card stock @ 5 3/4" x 12." Score @ 3 3/4", 7 1/2" and 11 1/2" and fold into mountain and valley folds. Cut 1 @ 5 3/4" x 7 1/2." Score this piece at 3 3/4"
Glue all of them together end to end at the 1/2" folded end-making a long continual accordion piece. Adhere the covers onto the 1st and last pages. I like to do all the pockets a little differently. They are all 3 1/4" wide but I cut them at various heights and diagonals. I just eyeballed those cuts. Then decorate them anyway you want! Now hop along to see what Hetty made. 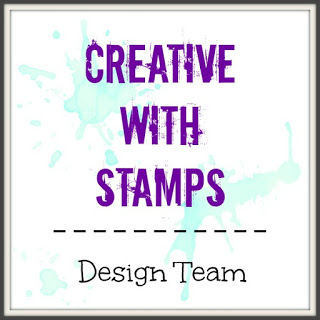 Make sure to link up your creation using this beautiful collection! 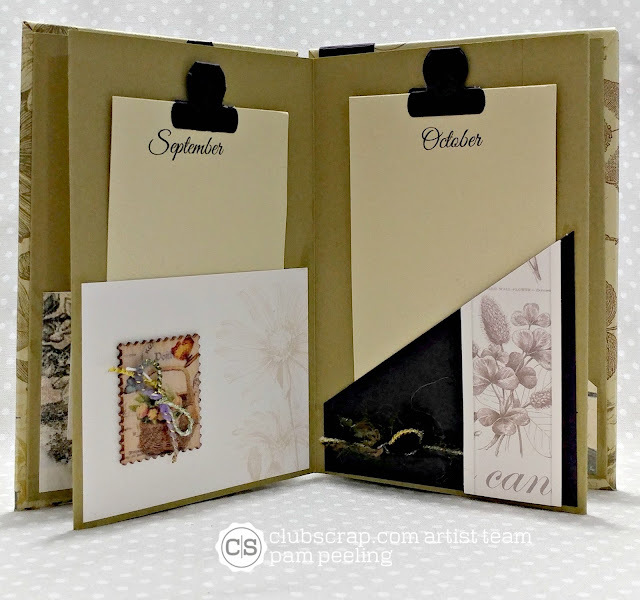 I love this kit from Club Scrap and love how you used them to make this accordion fold perpetual calendar. What a beautiful piece to display on your desk. Love it! My goodness, what a lovely book Pam. The details are just gorgeous! Really cool book and i like the idea of making this a perpetual calendar. I just love anything interactive! Aren't those images fun to color? Great design Pam, I love all the pockets with removable tags. Thanks for sharing the step out instructions! Such a fun way for a perpetual calendar. I think this will be fun to make as gifts. Thanks for sharing. Pam I love this idea and it's so pretty with Vintage Botany paper. What a lovely project is this calendar, Pam. These papers are great for it. It makes a wonderful gift. Very cool idea...I love all of the pockets. This would be great for storing bits of ephemera gathered in travels too with the journal/month card to write down each memory. TFS! Oh this is just lovely! A pocket for each month is really nice, great perpetual calendar style! Love all the pockets and the pull tabs are adorable. What a pretty...and practical...project! Perfection! Very pretty!!! I see lots of possibilities for this project! Oh, I love this project. The papers make it look so elegant. TFS. What a fun project and useful too! Everyone needs one! I just LOVE how you made it look like a clipboard! Brilliant!! !